La Plage is a French cuisine restaurant amidst beautiful apple orchards in Old Manali. Apart from serving delish food and breathtaking view, you must visit for their weekend music nights bringing in popular DJ’s and live artists through the summer months. If you think your weekends are supposed to be limited to the city boundaries partying at noisy clubs? Let this resto change your thinking forever. La Plage is located approximately one kilometre away from the clubhouse in Old Manali that serves lip-smacking French cuisine with a magnificent view of the Himalayas. Imagine this – you sipping your coffee, munching on your mushroom quiche while watching the Himalayas resting peacefully in the lap of river Beas (gasps). Beautiful, right? This resto has both indoor and outdoor seating. 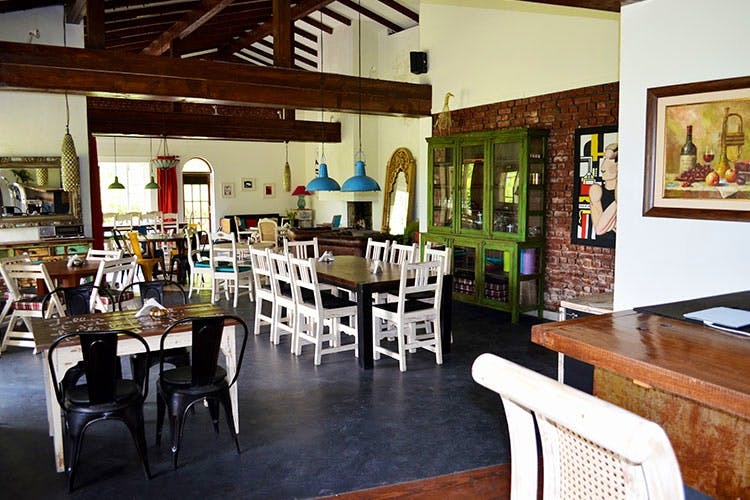 The indoor ambience is super chic with old-school wooden furniture and large wooden windows making the area sun-lit. The view pretty much fills your appetite, but the delicacies offered at the restaurant will double the experience. French specialities such as Butter Trout Fish, 12-hour braised Mutton, gourmet burgers for both vegetarians and non-vegetarians amongst other culinary specialities form a delicious menu to feast on! To end your heavenly sojourn La Plage, do try their signature Chocolate Thali – an assortment of chocolate desserts. Ditch that mundane party life, plan a road trip with your gang of boys or besties or just fly down. There are plenty of sightseeing options that will definitely glorify your Instagram. To know more, follow them on Facebook.